A couple of days before my birthday a couple of weeks ago, Beloved and I had dinner at Shuin. This Chinese/Taiwanese restaurant is located near the most Chinese-centric street of Quezon City, Banawe. We never ate here before becuse Beloved cannot find it, but she has heard of it and wanted to go. Since she now has that information, she convinced me to try it out. While not in Banawe itself, it’s just a very short walk when you reach its intersection with Maria Clara Street. The place was like a diner, only evidently Chinese. Honestly, this reminded me of a Singaporean hawker, only with a single concessionaire. And, as if we were really in Singapore, the waitress was a bit unaccomodating. While she did manage to get all our orders correctly, she hastily disappears upon hearing an item without confirming if this is the entirety of our order. And even though she’s waiting by our table, it looked and felt like she didn’t have our full attention. I found there’s little reason for her to be preoccupied as the restaurant wasn’t full and definitely wasn’t as busy as, say, nearby Ling Nam. Anyway, the specialties of the place are smoked meats, specifically poultry and pork. 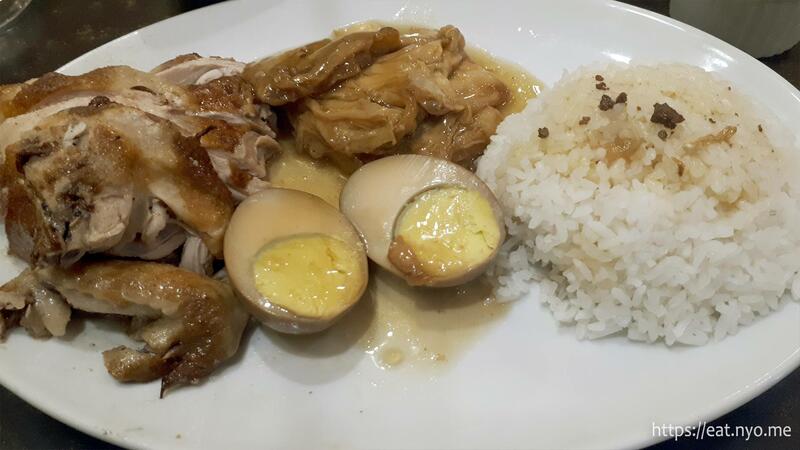 I decided to order their most expensive rice meal in the menu, the House Special Rice (260 Php) while Beloved ordered their Smoked Chicken Rice (195 Php). These rice meals come with two free side dishes, which is a selection from their short orders. I got their Stewed Taope and Stewed Tofu while Beloved also got the taope and Soy Egg. Finally, we also got their Steam Dumpling (120 Php). The House Special Rice is arguably the best thing to get here if you can afford it. It sampled this place’s specialties, specifically their smoked chicken, duck, and pork as well as their Chinese sausage. My favorite was the fatty duck with its crispy skin, then, the almost melt-in-your-mouth pork. It should be noted that the pork isn’t the usual sweet asado, rather it’s more smoky and not sweet, highlighting its natural juices. It’s sort of a tie between the Chinese sausage, which is a bit sweeter than I would’ve liked, and the chicken, which wasn’t the best-tasting chicken I’ve had; maybe they should’ve used or given me dark meat. They were still both okay, though. Beloved’s Smoked Chicken Rice is essentially just like my order, replacing all the meats with just their smoked chicken. With the same sentiments, it was cooked through, but not the best—a bit bland. With that said, for our sides, the Stewed Taope was the best. It’s essentially beancurd skin, which I really, really like for its wonderful texture, especially the outermost layer. The firm Stewed Tofu was not bad too—I just found it a bit funny it’s served like a stick of butter. While a bit mild in taste in itself, the savory sauce more than makes up for it. Finally, beloved’s Soy Egg was halved, so we were able to share easily. Not bad, but not great and a bit overdone. The Steam Dumplings were okay, not the best, but also not the worst. I like that the wrapping wasn’t too thick, but, sadly, the fillings weren’t too siksik as well. Fillings-wise, it’s your usual mince of meat, possibly pork, and kuchay, or chives. A dipping sauce, provided on the table, is required to enjoy this dish. 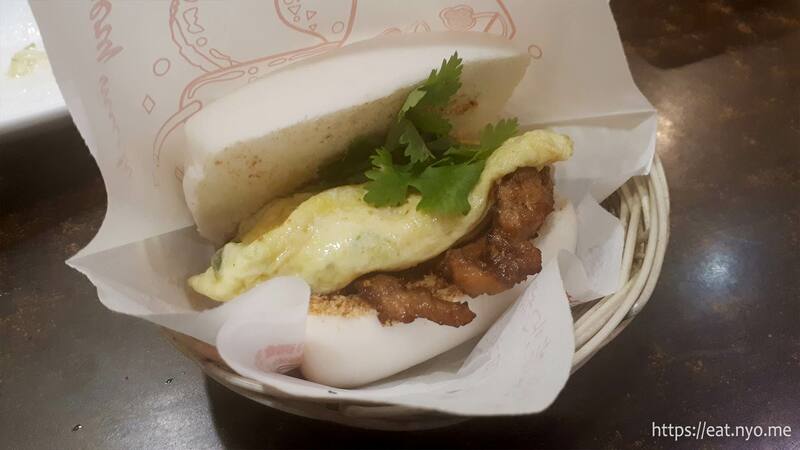 It seemed the amount of porkchop on this Porkchop Bun was reversed from the amount of omelette as pictured; it should be called “Egg Bun with Pork”, instead. Garnished with wansoy/cilantro, I removed it immediately. 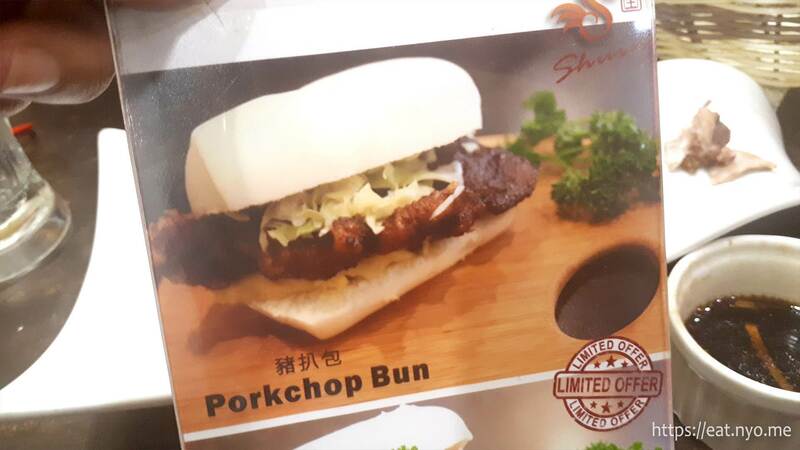 While admittedly, the porkchop tasted good, there’s just too little in this bun to enjoy. It felt more like a Chinese take on Egg sandwich. On the plus side, the bun portion was quite delicious on its own—soft and fluffy and very springy. Also, it’s not too expensive, so it’s not a great loss. 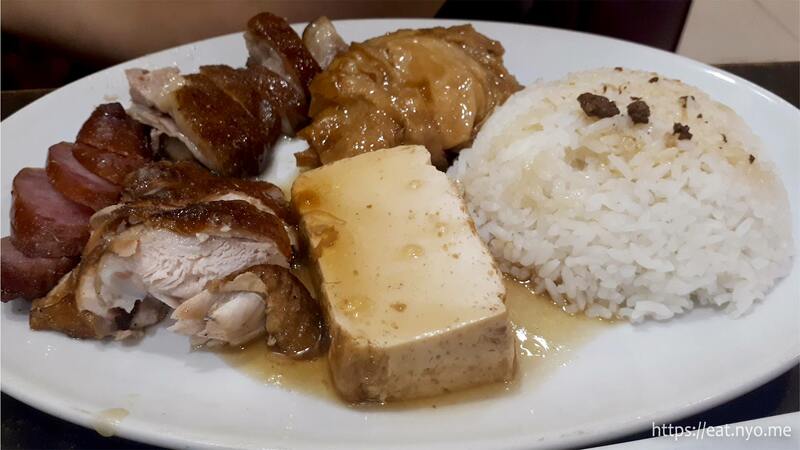 With the large number of competition in the area, you have to stand out as a Chinese or Taiwanese restaurant in Banawe. 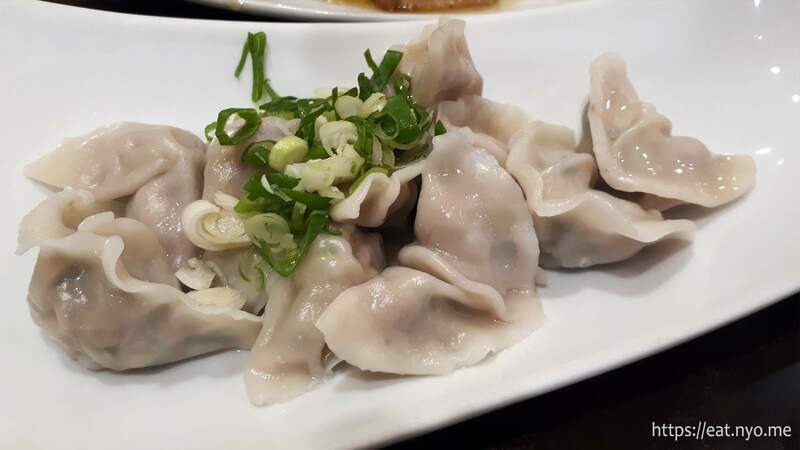 However, Shuin is unique in that their specialties aren’t the usual dimsum or mami. Although they do offer these as well, you must go here for their smoked meats which are a bit more uncommon in the area. These meats are available on their own, on rice meals, and on their noodles which they offer both dry and in soup. Honestly, my primary complaint is that their staff was not as complaisant as I would like—my complaints on their food can be overlooked. But maybe that adds to the genuineness. Either way, for its food, Shuin was definitely worth the try. Recommended for: Smoked duck or pork lovers. Not recommended for: Those who expect exceptional service. Smart nomnomnom tip: Get their House Special Rice to sample their specialties. Previously: Sisig Society Up Next: Cheesecake Etc.